By switching to simpler alternatives, you can make Diwali enjoyable for all. While we are busy celebrating the festival of lights, do we realize how we are slowly but surely also harming the environment? Instead of bursting crackers and contributing to pollution, how about opting for earth-friendly alternatives this year? Diwali is about sharing and spreading happiness. Rohit Bansal, director, Prana Air suggests that you use natural colours over powder. "Use colours derived from rice powder, paste, coffee, tea, turmeric powder, flowers and leaves,” Bansal says. Using clay diyas this time will definitely create a mesmerizing effect of lights. "Clay diyas are decomposable while burning candles adds to air pollution and lights consume electricity," Bansal explained. Khyati Mahajan, founder, MevoFit explains how you can replace crackers. "Ditch firecrackers for a bonfire in place of burning cracker. Sing and dance around the fire and enjoy the festival with friends and family." Diwali can be a very frightening and confusing time for pets. Take them for a walk in the day before the festivities start, says Khyati Mahajan. "Always shelter a terrified stray when people go berserk with crackers in the evenings," Mahajan said. Make an effort to separate bio-degradable and non-bio degradable waste. Take the effort to clean up your society/locality after the celebrations are over. Pooja Duggal, health coach and founder HealthHunt suggests you go for thoughtful gifting and recycled décor. Use natural plates like banana leaves instead of plastic plates for distributing prasad or recycled paper sheets and boxes for packing gifts. Jai Dhar Gupta, environmentalist and founder, Nirvana Being appeals everyone to make conscious choices this Diwali. 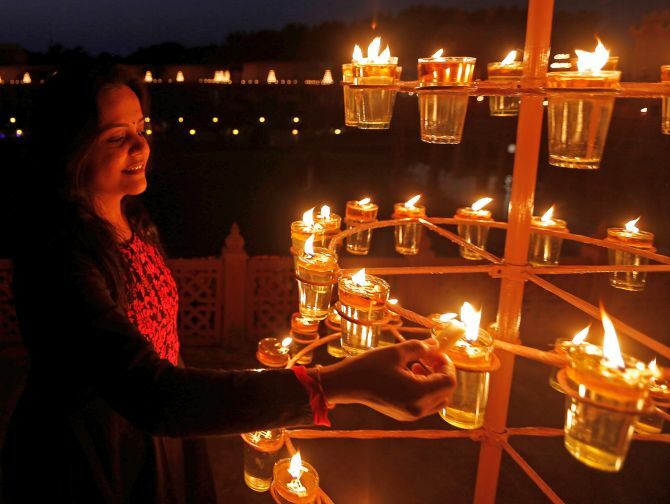 "Most of the stuff we buy and use during Diwali is non-biodegradable and eventually the entire waste ends up in a dump somewhere in a landfill. We need to become more aware of our actions and the consequences of their impact on the already polluted environment." "It is necessary and wise to consume energy thoughtfully. During and after Diwali, people suffer from breathing problems, health and heart issues, high blood pressure and hearing disabilities." This year, let's try and make Diwali more enjoyable and friendly for humans, pets and our environment.